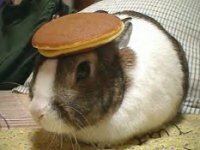 If a bunny with a pancake on it's head isn't random, then this page wouldn't exist. Randomness will reopen sometime in 2010 with a new look, new content, whatever I can't find another place for on the web. In the mean time, check out my new site, Linkfest! More links than you can shake a stick at. Try it today!